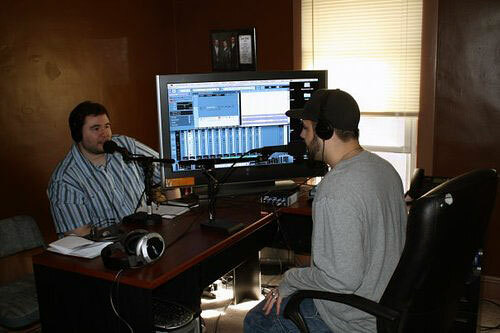 This is the story of Bobby and Jason, formerly known as paranormal investigators, now known as the hosts of a weekly live-audio show, five years running, called Strange Frequencies Radio. SFR has had guests that run the gamut from Dr. Neil DeGrasse Tyson to a paranormal advocate who calls himself OrbDog. Bobby and Jason have accomplished a transformation the likes of which remain mysterious and elusive—giving up on ghosts. At age sixteen, Bobby Nelson began ghost hunting at his friends' houses. He had had personal experiences in his own home that he interpreted, at the time, as paranormal. A devout Christian, Bobby was taught that if you believed in evolution, you were going to hell. Demons were real. There was life after death. He recalls that the original “Ghost Hunter” Harry Price was his idol, and he aspired to obtain a degree in parapsychology, eventually starting his own investigation group. For Jason Korbus, it was curiosity about the unknown and macabre that drew him to paranormal investigation. From a non-religious background, he never had an experience that he would have labeled “paranormal” but was a fan true crime stories and of TV shows like Unsolved Mysteries and Sightings that had actual scientists commenting. The stories looked legitimate, like a news broadcast. These shows reinforced his belief in ghosts. He saw Ghost Hunters and was amazed people did this for a living. Why not give this a try? So he did and joined a paranormal group. In their twenties, in Toledo, Ohio, they became friends through their mutual interest of the paranormal. With their respective groups now one organization, eventually named Phase 3 Paranormal, they visited people’s houses in and around Ohio, collected EVPs and electromagnetic readings, interviewed the witnesses to the events and wrote up case reports, just like all the other paranormal groups. They believed they had found paranormal activity and had concluded this was evidence of ghosts. EVPs were concluded to be the voices of the dead. They recruited interested individuals for the group via MySpace, craigslist, and the local paper. No special qualifications were needed to join although they administered an exam to new recruits to see how much they knew about the paranormal. Bobby remembers the ease in which people would give their social security number to him under the pretense of a “background check.” This was his ploy to test for trustworthiness, since he had no means to actually run a background check. He figured if they would give him their SSN, they had nothing to hide. Jason says they definitely were a “sciencey” group. They “absolutely” thought they were doing science—because of the equipment. For example, Jason explained to me that they would take a “baseline reading” of the house by walking around the rooms very slowly,waving the EMF meter around and recording the numbers on paper. Then later, after they “provoked” the ghost, they would do the same thing a second time and record the numbers. Equipment made them feel important. Teams judged each other by their equipment. While thermal imaging cameras (especially FLIR systems) were the epitome of the equipment bragging rights (TAPS, the Ghost Hunters TV show group, had a FLIR). The next best was the trifield meter. “If you could afford a trifield, you were badass,” says Bobby. “I had a trifield!” Jason adds. What was it about EVPs, I asked, that was “scientific”? “Sharon,” Jason says slowly in a fake patronizing tone, “it was a RECORDER and it was DIGITAL! We were getting voices from dead people!” At the time they relied on such devices, it was not a joke. They felt they were on the verge of finding something extraordinary; that is, documented evidence of ghosts. Believing science was ignoring the paranormal, they were seeing it for themselves. Both Jason and Bobby were observant and started to notice some disturbing inconsistencies in the field. While they didn’t want to admit it then, they were basing their techniques—and even their jargon—on the Ghost Hunters TV show. They assumed what was on TV was valid because everyone else was doing it too. They did the “reveal” for the client. Jason remembers he used to always say, “We’re here to help,” just like they did on the show. Half of their cases seemed to be attributable to haunted people rather than haunted houses. “I don’t know what you found before, but this house is REALLY haunted,” was a frequent repeat quote. Often they found that other ghost groups had been there before them and told the residents that EVPs (Electronic Voice Phenomena) were obtained with crazy results. This freaked people out and reinforced their fears. People were attributing everything that went wrong in the house to the “negative energy” present—health issues, fighting in relationships, even an abscessed tooth was reasoned to have something to do with a ghost. Jason and Bobby describe the paranormal mantra of “there are no real experts in this field” as “a bubble you can put over yourselves.” It was an anything goes atmosphere without standards. They couldn't help but wonder how certain people on certain teams could get such different results. How come Bobby and Jason didn’t see ghosts like others did? When they began asking questions, the façade started to crack. They couldn’t find definitive answers regarding electromagnetic field readings. What was really happening there? Are there other explanations? When they did the flashlight tests and EMF readings at NONHAUNTED locations, why did they get similar results as a HAUNTED location? Bobby owned a recording studio. He took some EVPs to his sound engineer who was only able to tell him that it was within the range of human hearing but not if it was anything unique. He certainly didn't say they were paranormal. They relate one incident where Jason knew he’d zipped up his backpack during an investigation. On the audio playback, someone else said it sounded like a voice saying “Del Rio.” They started to think these EVPs were not all that reliable. If it was this easy to make a mistake in interpretation, what about all the other “evidence” they had? There was no final AHA moment for either of them; it all just gradually slipped away. The pair had been planning to do an Internet radio show for a while. It was taking them forever to get going on it. So at the start of Strange Frequencies Radio in late 2008, they still held a belief in the paranormal but it was significantly eroding by then. Bobby says Jason “gave up the ghost” before he did. When Jason admitted he didn’t believe in this stuff anymore, Bobby was upset. “I was f**king crushed! It killed me inside to hear him say he didn’t believe in ghosts.” Yet Bobby was also well along the path of skeptical thinking. Peer influence and community interaction affects how we relate to issues in our society. 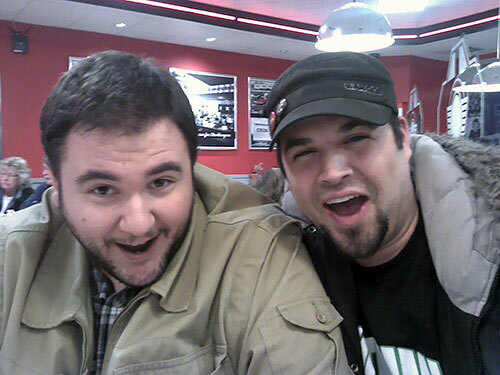 Bobby and Jason’s paranormal investigations had been influenced by pop culture and the paranormal community. Now, their circles of influence were changing. Bobby is proud of the regular phone conversations he used to have with William Roll, an esteemed parapsychologist who investigated poltergeists and haunting cases. Roll died in January of 2012. Roll had mentioned James Randi in his conversations in a not-very-complimentary way. Bobby wondered, who was this guy, Randi? Randi came on SFR for an interview. Bobby recalls how he tried to nail him with the standard tropes such as the law of thermodynamics. It’s an embarrassing memory now, as are many of their public pro-paranormal pronouncements. Randi has since been on SFR additional times; Jason and Bobby consider him a critical influence on their thinking as well as Michael Shermer, Ben Radford, and Kenny Biddle (another ghost hunter turned skeptical advocate). The tone of SFR has changed drastically over the years. The supernatural and paranormal ideas had all evaporated. Their enthusiasm and curiosity, however, had not. While listening to their discussions on Strange Frequencies Radio (SFR) for about two years now and interviewing them for this piece, it seemed to me there was CLEARLY something about their friendship that played a part in their individual journeys from paranormal advocates to critics. I asked them how much of an influence they had on each other. They both agreed it had been significant. They had reinforced each other in the practice of questioning, examining, and gaining new perspective. Bobby would ask questions, and then would buy a book. Jason would borrow the book. They would discuss their new ideas. “It was good to have Bobby there—the only one willing to go down that road with me,” Jason states, “anyone else would get hostile.” No criticism was allowed in the ghost hunting clubhouse. It still isn't. Given the label “paranormal unity” by active participants, this proposal was basically an agreement to not make fun of or disparage other groups and their ideas. Think about that—no critique. No mistakes are ever corrected. No progress is ever made. And that’s how it currently stands, years later, with popular paranormal investigation. The case reports from Phase 3 Paranormal investigations remain in binders and in boxes. The media contacts don’t respond after hearing their new stance that demons don’t exists or Ouija boards aren’t a portal to the afterlife. The websites of dozens of other ghost groups that used to be active in Ohio have been neglected for years now as the novelty wore off and real life intervened. Some things change and some stay the same. It's easy to believe. It takes an effort to be skeptical. As we see with Jason and Bobby, you have to stop and train yourself to think this new way and let go of a previously sacred idea. When Bobby heard the explanation of his paranormal experiences long ago as sleep paralysis instead of demons, he says he was comforted by the reality-based explanation, not disappointed. Many people invested in paranormal belief and research will not be able to let their decades of investment go. Bobby reasons that he didn't have as strong of an emotional tie to paranormal ideas as some people. He understands that people don't want to accept their time and money has been wasted. And to some, there is a deep-seated need to validate the afterlife, believing things like: “that orb is Grandma.” No matter what. These days on Strange Frequencies Radio, they are able to have productive conversations with those who still may hold on to those paranormal beliefs. Recently, they have started exploring with guests a common point of disbelief between them. Invariably, they will find a parallel in baseless assumptions with what they do believe. They will attempt to explore that aspect and maybe in the process, plant that seed of doubt. Sometimes, that's all you can do. Jason is clear about his beliefs: no ghosts, no paranormal, no supernatural at all. “I don't care that people do [believe that stuff], but keep your hobby out of other people's houses.” Both men regret that they may have done harm to people by telling them what they thought was true at the time. They thought they were helping. Now they hope they are helping spread critical thinking about the paranormal.